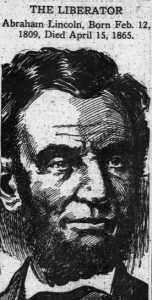 President Abraham Lincoln, who led the country during the Civil War, is known as the “Great Emancipator.” He drafted the Emancipation Proclamation, which freed black slaves in the United States. Here, we examine President Lincoln’s viewpoints on slavery. Based on the evidence that follows, students can determine whether he actually freed the slaves. ELA.RH.6-8.4 Determine the meaning of words and phrases as they are used in a text, including vocabulary specific to domains related to history/social studies. Historical Knowledge 8.1. Evaluate continuity and change over the course of U.S. history by analyzing examples of conflict, cooperation, and interdependence among groups, societies, or nations. Historical Knowledge 8.2. Evaluate continuity and change over the course of U.S. history, by analyzing key people and constitutional convention, the age of Jefferson, the Industrial Revolution, Westward Expansion, and the Civil War. Historical Knowledge 8.3. Examine the social, political, and economic factors that caused Westward Expansion from the American Revolution through Reconstruction. Historical Knowledge 8.4. Evaluate the impact of different factors, including gender, age, ethnicity, and class, on groups and individuals during this time period and the impact these groups and individuals have on events of the time. Historical Knowledge 8.5. Analyze the causes as outlined in the Declaration of Independence, and examine the major American and British leaders, key events, international support, and consequences of (e.g., Articles of Confederation, changes in trade relationships, achievement of the independence by the United States) the American Revolution. Historical Thinking 8.6. Use and interpret documents and other relevant primary and secondary sources pertaining to U.S. history from multiple perspectives. Historical Thinking 8.7. Analyze evidence from multiple sources, including those with conflicting accounts about specific events in U.S. history. Historical Thinking 8.8. Evaluate information from a variety of sources and perspectives. Historical Thinking 8.9. Construct or evaluate a written historical argument demonstrating an understanding of primary and secondary sources. Geography 8.10. Interpret maps to identify growth and development of the United States. Civics and Government 8.14. Explain rights and responsibilities of citizens. Civics and Government 8.15. Contrast the impact of the Articles of Confederation as a form of government to the U.S. Constitution. Civics and Government 8.18. Examine and analyze important U.S. documents, including (but not limited to) the Constitution, Bill of Rights, and 13th-15th. Civics and Government 8.20. Analyze the changing definition of citizenship and the expansion of rights. Civics and Government 8.21. Analyze important political and ethical values such as freedom, democracy, equality, and justice embodied in documents such as the Declaration of Independence, the U.S. Constitution, and the Bill of Rights. This lesson plan offers two options for presenting the historical walkthrough. Introduction: Pose the question of whether President Lincoln actually freed the slaves. You may wish to start off the lesson with a discussion about students’ opinions of whether President Lincoln freed the slaves. Optional: Write down what students think on a piece of chart paper. (An opinion chart has been provided below.) Then, after the historical walkthrough, take another opinion survey. Lead a debrief session about why students’ opinions have changed. Some questions to consider are provided below. Give students the handout with information and read as a whole group. Organize students into partners or groups to work on and read handouts together. Encourage students to take notes on the pieces of information they have read. These should include initial reactions to the statement, whether they agree or disagree, something interesting they learned, etc. Also, encourage students to look up the original document using the link provided. Once students have finished, bring together for debrief. Print handout and cut into strips. Tap, glue, or tack timeline somewhere students may access. Pass out strips to each student. You may want to number each strip to minimize level of chaos, or have students line up in numerical order. Choose the first event and have the student read out loud. Give students time to discuss what the event describes, as well as their initial reactions with their group members or partners. Lead very brief discussions about each event. Tape or glue the event on the timeline. From the articles, what would you consider President Lincoln’s opinion on slavery and slaves? Do you think President Lincoln can be described as freeing the slaves? Why or why not? You may wish to assign the essay after the activity and discussion. Give students the opportunity to present their essays to peers either through a formal or informal setting.